In the “Where They Are Now” files, we have an update on former Met phenom Lastings Milledge: he has been designated for assignment by the Chicago White Sox. Indeed. 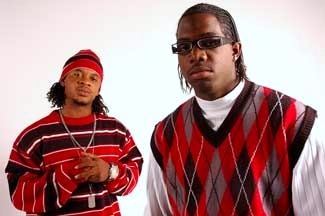 Whatever happened to Lastings on that road? Remember when he was the top prospect in the organization, and one of the top in all of baseball? Remember when people were comparing him to Willie Mays? When scouts excitedly spoke about his “bat speed”, comparing it to “a young Gary Sheffield’s” ? Remember when we fans were in a tizzy that we “threw away” Milledge for Ryan Church and Brian Schneider? Funny how things work out. We saw Schneider playing for the Phillies last night, by the way, so he’s still employed. Now that Lastings Milledge has been DFA’s, the White Sox have 10 days to trade him, release him, or send him to the minors, what do you think — should the Mets bring him back? Of course, if things don’t work out on the ballfield for Lastings, he has other talents to fall back on. Next Mets Are a Punch Line? My boy sports WICKED argyle. On the “who wants him” front, why wasn’t Nick Evans claimed off waivers? 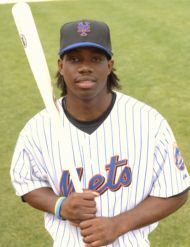 ah, good old Lastings Milledge… from Game tying HR off Benitez ? –> high five fans –> traded –> DFA. All in what seems quicker than the length of today’s game. Who else would it be, keed? What Milledge proves is that all the hype about all the “great” prospects is meaningless. If someone wants to give you a star for your star of the future go for it. For every Hanley Ramirez there are at least 10 Lastings Milledges. Even the great botched trade to dump Kazmir wasn’t so bad. He turned out to be a flash in the pan, overpaid and not even average. He wasn’t overpaid by the Mets at the time and they didn’t get anything that useful in return.